Love the song. Know it well. I do have one of his double barrel 12s and the stock is cracked. These guys are about 20 min. from Dansville, wont tell yea which way but I have had a lot of activity around 8 am the past 10 days or so. I hope they all aren't still running together come opening day. Stands about 20 yards fro the cam and one of these old guys would probably pick me off trying to draw. Finally got a good pull last week. 3 bucks I Feel are shooters and 1 buck that's really young with some potential in a couple years. 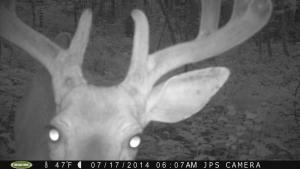 Got a few pics of different bucks fighting already.Opening day cant come soon enough. hey, just because theres a goalie dont mean yea cant score.... that chick is a smoke show with and with out a gun in her hand. Now my deer havest photos have to be politically correct? Get outta here... I'll take one in the moment. Photos are nice but to me, a photo cant capture the moments about the hunt, harvest, or the people you share those moments with. The biggest deer ive ever shot, the best part about that was seeing my dads face when he met me at the house. Ill take those over the "pretty" picture. Just got done mowing the yard. It looks over a 30 acre field and I watched a nice buck, at least 2-1/2 year old run across the field, run a smaller buck off and then follow 3 doe into the woods. Anyone else seen activity like this yet? So I got this guy Friday morning, but the pictures are really grainy for some reason. Either way, just wonding what others think about points/score because the pics arnt so good and everyone i show has been pretty different.